The start of another Formby year commenced with the March 2019 meeting in The Imperial Hotel, Blackpool. Another well-attended meeting gave hope that the year of 2019 will be a good one for the development of the Society. It was nice to meet up with Chris Webster and a real surprise for many members when Dickie Speake made a rare appearance. Dickie has not been to a Blackpool meeting for five years but came and entertained and chatted with many members both old and new. It was great to see him back on stage again, for the few that may not know, Dickie was the keyboard player for many years from around 1990 and his backing tracks are still used by many players within the GFS. Stephen is one of numerous returning members to the conventions after spending some years away. He was here in November and enjoyed himself so much that he is now back in the fold as a convention regular. Dean Spencer is another old friend who is always welcome and can share keyboard duties with Matt Richards. Also to make my weekend complete, another great pal turned up who I have not seen for some years. 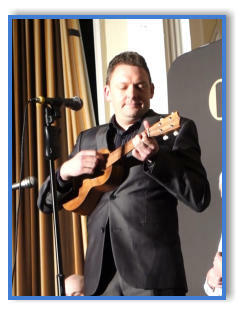 Von Hoffman was back with us from London and as usual featured songs by George Formby Snr. Nobody does Formby Snr better than Von! A smashing bloke and a great character on stage. Tom Cutler is another talented player who returned last year and what with Dickie Speake and Chris Webster, it is like going back to the iconic early 1990s when the GFS really blossomed, especially after the wonderful Warrington Exhibition. Valerie Payne was a popular visitor to Blackpool in the 1990s and is also now making the long journey from her Devon home to savour the delights of the GFS Blackpool weekend once again. Banjo supremo Sean Moyses was back again to give not only George Formby songs on his banjo- uke, but also his usual stunning performance on the full-size banjo. Another friendly face from the 1990s was Janet Grootoonk who made the long trip from Holland. Another overseas visitor flying in from sunny Spain and always very welcome was Brian West. 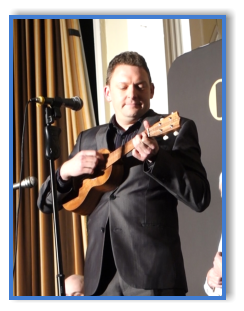 One recently joined member is Simon Rose who makes the long journey from London for each convention and always appears to bring something new to the Blackpool stage. 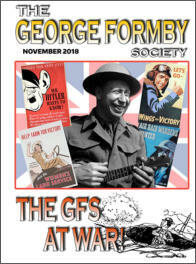 His Formby performances are always entertaining and his November war-time performances were well prepared with interesting information and good songs. We have seen him do a tap dancing routine and for this meeting, he produced a musical saw! 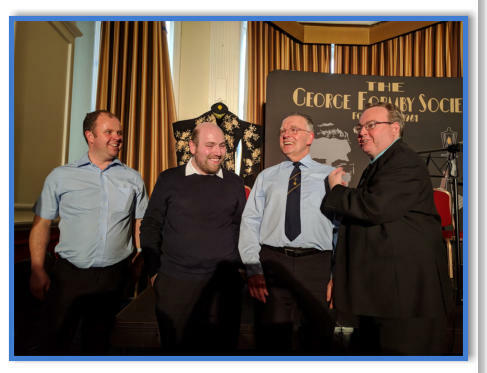 We had a multi-language version of “Leaning On A Lamp Post” from Stuart Boston and John Walley, Stuart sang the song in the Welsh language and John delivered the song in the more familiar English tongue. GFS chair Caroline Stewart joined up with Johnny Key for a good rendition of Rick Nelson’s, “Hello Mary Lou”, with the duo both playing guitars. We have seen Johnny with his guitar in the past but this was a first time on the Blackpool stage for Caroline’s guitar and as usual, she and Johnny did not let us down. 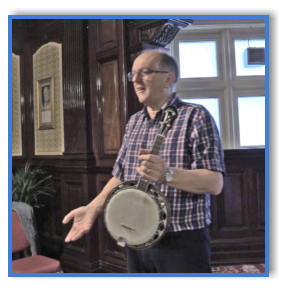 One of the best bits of the weekend happened in a small room on Sunday afternoon when ex-President of the GFS and the leading authority on the banjo- uke, John Croft gave a fascinating talk on George Formby instruments and Formby himself. For almost one hour he stood and entertained a room full of people with his vast knowledge of Formby and the instrument. The last time we did anything at all like this was when John Walley sat on stage with Billy Uke Scott and interviewed him one Sunday afternoon in the Baronial Room of the Winter Gardens and entertained a capacity audience with wonderful reminisces of Billy’s life in show business. It begs the question, surely John should have the chance to speak again but this time in the main concert room with the sound system to aid him. 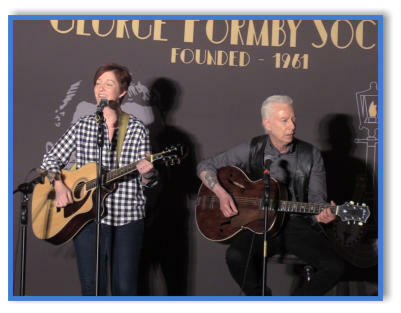 We seem to concentrate the entire weekend on a concert of Formby songs when there is so much more to the fascinating story of George and Beryl Formby. Within the GFS we still have John Croft and John Walley to take us to places that newer members cannot go to. Is it too late to start tapping into their knowledge by way of lectures on the man, his life and the music that we all joined up for originally? Personally, I would love to see something like this happen, even if it was just for a forty-five-minute session just once or twice a year. 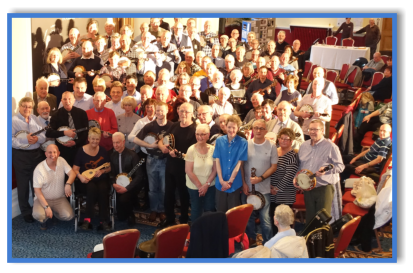 Before John had closed his session, members of the audience were speaking up about their own memories and knowledge of George Formby. So this little session actually brought everyone together probably far better than any concert ever could. Stephen is one of numerous returning members to the conventions after spending some years away. He was here in November and enjoyed himself so much that he is now back in the fold as a convention regular. Dean Spencer is another old friend who is always welcome and can share keyboard duties with Matt Richards. Also to make my weekend complete, another great pal turned up who I have not seen for some years. Von Hoffman was back with us from London and as usual featured songs by George Formby Snr. Nobody does Formby Snr better than Von! A smashing bloke and a great character on stage. Tom Cutler is another talented player who returned last year and what with Dickie Speake and Chris Webster, it is like going back to the iconic early 1990s when the GFS really blossomed, especially after the wonderful Warrington Exhibition. Valerie Payne was a popular visitor to Blackpool in the 1990s and is also now making the long journey from her Devon home to savour the delights of the GFS Blackpool weekend once again. 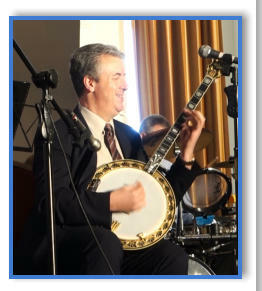 Banjo supremo Sean Moyses was back again to give not only George Formby songs on his banjo-uke, but also his usual stunning performance on the full-size banjo. Another friendly face from the 1990s was Janet Grootoonk who made the long trip from Holland. Another overseas visitor flying in from sunny Spain and always very welcome was Brian West. One of the best bits of the weekend happened in a small room on Sunday afternoon when ex-President of the GFS and the leading authority on the banjo-uke, John Croft gave a fascinating talk on George Formby instruments and Formby himself. For almost one hour he stood and entertained a room full of people with his vast knowledge of Formby and the instrument. The last time we did anything at all like this was when John Walley sat on stage with Billy Uke Scott and interviewed him one Sunday afternoon in the Baronial Room of the Winter Gardens and entertained a capacity audience with wonderful reminisces of Billy’s life in show business. It begs the question, surely John should have the chance to speak again but this time in the main concert room with the sound system to aid him. 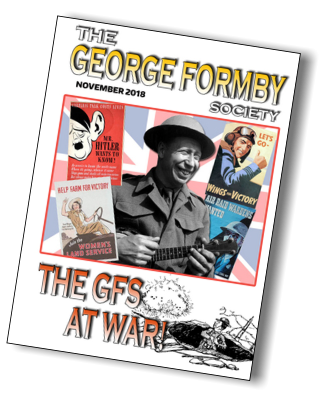 We seem to concentrate the entire weekend on a concert of Formby songs when there is so much more to the fascinating story of George and Beryl Formby. Within the GFS we still have John Croft and John Walley to take us to places that newer members cannot go to. Is it too late to start tapping into their knowledge by way of lectures on the man, his life and the music that we all joined up for originally? Personally, I would love to see something like this happen, even if it was just for a forty-five-minute session just once or twice a year. 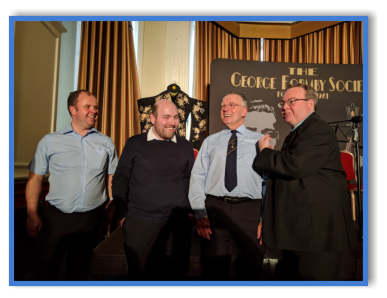 Before John had closed his session, members of the audience were speaking up about their own memories and knowledge of George Formby. So this little session actually brought everyone together probably far better than any concert ever could.